I was just driving on the highway and went to pass someone uphill, so I went to put it into 4th gear (from 5th or 6th). I somehow made the mistake of putting it into 2nd and the engine screamed and probably hit about 9k or 10k RPMs (redline is like around 7k). Right after I heard the engine jump up, I quickly put it into 4th. I have a 2015 Honda Fit with an L15B engine. How badly did I mess up and is there any types of checks I should do (or have a mechanic do)? 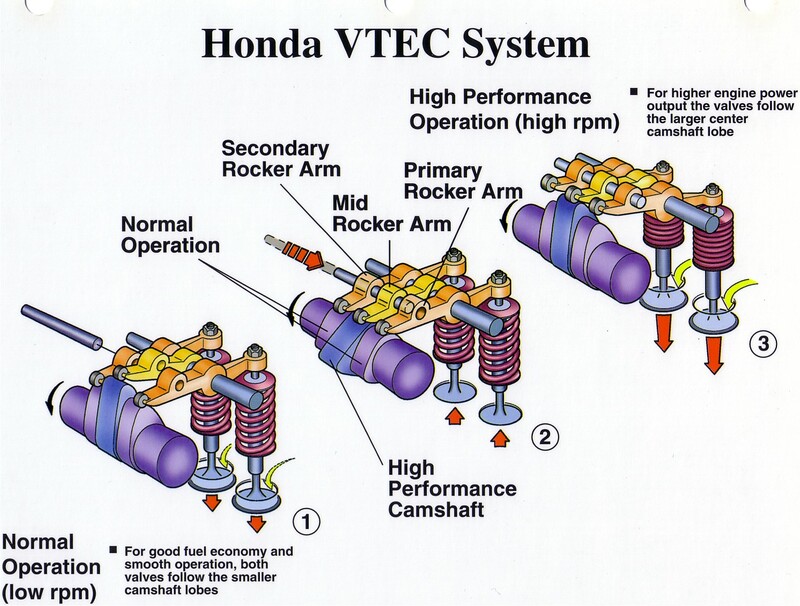 I would be primarily concerned with the i-VTEC cam related mechanisms. I do not see that this engine is an interference engine. If it were an interference engine and you floated your valves, you would have more than likely had valve to piston contact and that would have immediate effect on your motor as well as your driving experience, you would have been on the side of the road with a destroyed engine. My primary concern with what you described would be related to the engagement pin for the higher cam profile and the possibility of that shearing. I do not know or have any prediction on how accurate my concern would be, this is simply based upon my previous experience of seeing engine failure, not my experience with this particular situation or valve train type. The Concern - if the RPM's increased so rapidly that the engagement pin for the higher RPM did not have the time to insert itself into the secondary rocker and was sheared or the pin became rounded in the process of an attempted insertion. You may not experience issues now but if it became rounded the issue could be aggravated over time and become worse. If the pin was sheared then you would have some immediate effects such as reduced power at higher RPM's because the higher cam lobe is not getting engaged. As well, if it were sheared you would probably hear some noise coming from the top end as your would have some failed components floating about...but any lack of noise is not a guarantee that a failed event did or did not occur. Certainly I am not claiming that any damaged occurred. I have over revved MANY engines without any effect. As well, I have over revved a motorcycle engine and completely destroyed it as well. In my experience, it typically seems to be a binary experience. The engine is destroyed or it is not. I haven't experienced a grey areas when it comes to this. Rings - There are many vehicles that have limits that are considerably higher than the RPM your engine just spun up to. The chances of rings becoming damaged in their landings IMO is very small. If you did experience issue where there was damage you would probably experience hard starting/rough idle issues along with blowing oil smoke during operation of the motor. Gears - The gears on your transmission are balanced by default and locked into place. Chance of damage in this scenario is low. Connecting Rods - There are possibilities here. If you did experience an issue you would experience, at the least, a very rough idle as the stroke for some pistons would be different, at least in regards to max piston height in the bore resulting in a different compression ratio on that cylinder. Results would be rough idle at the least. Crank journals - Very real possibility that forces your experienced overwhelmed the hydrodynamic lubrication. If you had metal to metal contact on your plain bearing to your journal your would have reduced lubrication and possibly knocking from the big end connecting rod ID (inside diameter) to the crank OD (outside diameter). Best of luck to you on this. Hopefully everything is OK!! It's very hard to say what damage, if any, will have occurred. All I can tell you is from my own personal experience. I once went from the red line in 3rd gear with a wide open throttle to 4th at approximately 90mph on a 1983 Golf and accidentally selected 2nd (and managed to get the clutch up). The instantaneous effect was that all of the dials gave readings I've never before seen and the car behaved as if an elephant had been dropped onto the front bumper. I very quickly got back on the clutch but the damage was done. From that moment on, the engine would consume oil at an alarming rate. Typically getting through a pint in around 50 to 60 miles of normal driving. I hurriedly located a replacement engine and fitted it. Other than the increased oil consumption, the original engine continued to perform as it should, didn't get excessively hot, didn't leak, didn't use water and didn't feel down on power. I simply couldn't afford the increased engine oil bill. I'd suggest you check all of your fluid levels now and continue to check them at very regular intervals. You may be lucky and have no damage. The best way to find out is to closely monitor the engines health and see what happens. That is of course provided the engine doesn't develop any power loss or new noises. If the car continued to drive normally no damage occurred. Start it up right now with the hood open (it helps to hear noises you would normally would not). What if the cars feels weird? A misfire at idle and/or the rev range. Smoke coming out of the tailpipe due to oil sneaking into the combustion chamber. Hard to start due to the bent valves making the engine hard to turn over. This will make the starter sound strange. Your check engine light will come on. Any of these symptoms require a trip to the mechanic on a tow truck. Don't drive it there. More damage could occur. What if you dont notice anything like that? Move on and thank the car gods you did not bent a valve. The fundamental premise of an internal combustion engine is "pressure". The event described will have created pressures within the engine, far beyond anything it was ever designed to contain. The impacts on the mechanicals (moving parts) are secondary. Therefore the reliability factor of the engine is now zero. A catastrophic failure can be anticipated anytime. A threat to your personal safety exists anytime you drive the car. I have 34 years of automotive maintenance experience. Not the answer you're looking for? Browse other questions tagged engine honda rpm fit redline or ask your own question. 2015 Honda Fit LX, 20k miles, key will turn but engine will not always start on first try. Why? Engine Lugging at higher rpm?